Be forewarned, if you suffer from stage fright then this next bit might resurface buried memories to your childhood days of music or other performing arts recitals. I know it does for me. Yet, it seems that after we conclude years of extracurricular activities, which for some extend well into college days, we forget about the value of performing. The reality is entrepreneurship is both a grind and performance. It asks us to master varying degrees skills. From strategic thinking to leadership, or financial modeling to product design. We must continually show up ready to put them on display for our clients, partners, funders and ourselves. So this week, we’re asking: how might we get improve our performance? 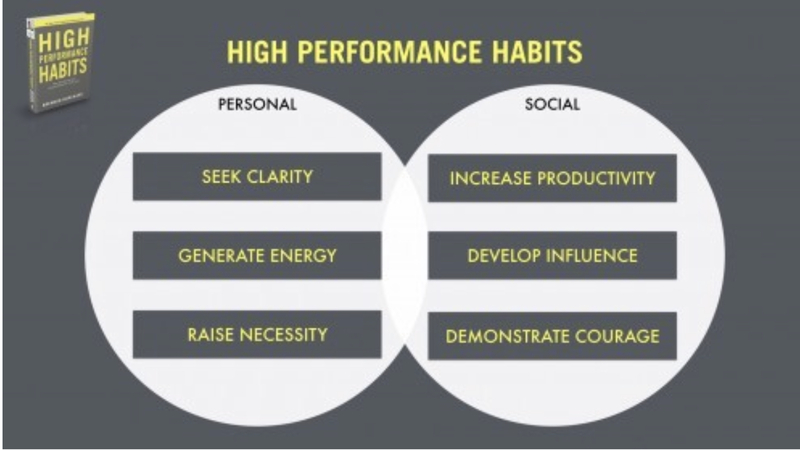 Burchard contends that when combined, these six habits are the key to high performance in personal and professional endeavors. (1) Achieve better results by not waiting for the “ah ha” moment when things to fall into place. Because, well, they rarely do. Rather, take strategic action steps towards obtaining clarity, not once but regularly. (2) Enter the cliché: life is marathon not a sprint. Although this adage remains tried and true. Just as your “loose 15 lbs New Year resolution” will fail if you go too hard too soon, the same is true in your entrepreneurial endeavors. Instead, anticipate burnout because it will come. And, design to avoid it. You can generate energy stores by including rest and reflection time into your schedule which will enable you to perform longer and faster. (3) Your “why” is just as important as your “what” Yet, we often loose sight of the purpose behind our actions and interactions with others. Burchard reminds, “your job is to prime your mental ability to perform an activity well.” In more simple terms, we raise necessity with mind over matter. (4) Productivity is one of those annoying “p” words like, patience, payment or present. All have the power to invoke a visceral positive (or negative) response. Being productive is less about quantity over quality–and it requires intentional and strategic thinking about the necessary steps to reach a desired outcome. Being busy is also not the same as being productive. Fpr 2019, consider this productivity hack: plan, prepare, perform– then repeat. These simple steps may be the difference between working smarter, not harder. (5) “High performers develop influence by teaching people how to think and challenging them to grow.” Burchard’s explanation of developing influence can stand well enough on its own. It underscores an overlooked element of high performance output: the human factor If you think about it, how often are your best plans laid to waste because other people served as a derailers? Typically, people are the variable over which you have the least control. However, expanding the depth of your influence will serve well in meeting your 2019 goals. (6) Find your courage. It’s in there somewhere. And, it’s attached to the belief that you have the power to see realized your vision of success. Don’t let anyone tell you otherwise. Surely these six habits are not the exclusive means of achieving your #2019goals. Drop us a note (or visit the #ThursdayGathering) and let us know: what good habits do you plan to develop this year?